This tutorial will show you how to write an iOS app that changes the color of the screen to match the color of the closest beacon. We'll be working with CoreLocation, and writing everything in Swift for iOS8 (as of 10/24/15 this has been updated for iOS 9 and Xcode 7.1). Although there are some nice SDKs out there, we aren't using anything but pure Swift for this. I want to show you how little code you actually need to get a proof-of-concept iBeacon app like this up and running. Plus, it's always good to have an understanding of what those SDKs are doing for you behind the scenes. 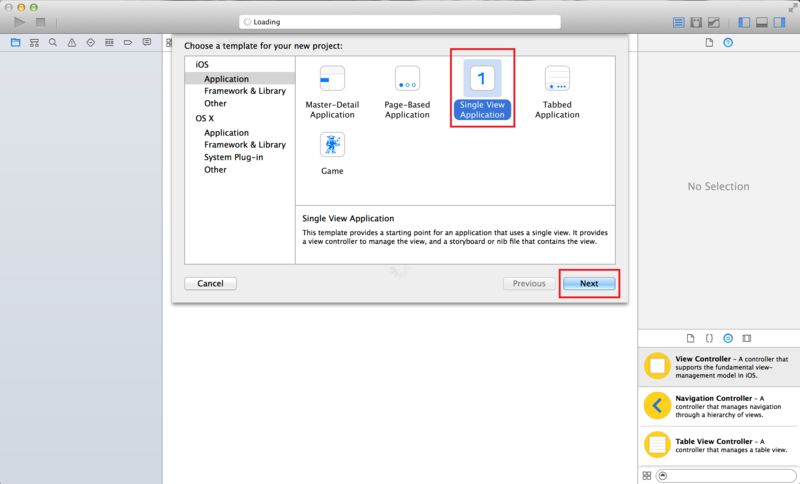 Xcode 6 or newer, so you can follow along with the Swift code. A BLE (Bluetooth Low Energy) iOS device (iPhone 4S or newer, iPod touch 5th gen or newer, iPad 3 or newer, or iPad mini) running iOS8 or later (we're writing in Swift). Make sure Bluetooth is turned on. You must use a real device (the Simulator cannot detect beacons). Beacons. I'm using Estimote beacons, but you can use anything you'd like. You can even download an app that will turn your device into a beacon, but it will need to be a different device than the one you're running this demo on. 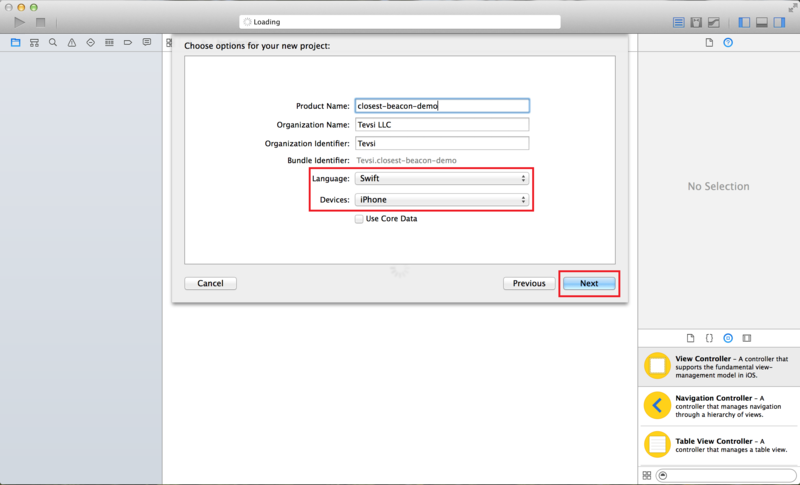 On the project options screen, make sure you choose Swift as the language. You may choose whatever you'd like in the 'Devices' dropdown. You will need to load the app on a real device, so choose whichever applies to you. Now as soon as our locationManager starts working, we'll be able to access the results right from inside our View Controller. But there are a few more things we need to set up before it'll be able to start working. The next step is to define the message that will explain why the user should approve the request. This is the text that will fill up the main section of the popup window that the system presents to the user. Open up your info.plist file (inside of the 'Supporting Files' folder) and add a new line by hovering over an existing line and clicking the circled '+' button. Add the key as 'NSLocationWhenInUseUsageDescription' (this will not auto-complete for you). Its type is a String, and you can fill in anything you'd like for the value. Now, you don't need to actually call this requestWhenInUseAuthorization() method every time the app runs, the user only needs to approve it once and your app will stay authorized. But if they go into settings and revoke your app's authorization, then you will need to ask again to be able to access location services again. Let's wrap our call in a conditional so that we only ask for authorization when we need it. Now, if the user denies the authorization, our app can't do anything. In a full-fledged responsible app, we would account for that denial with a message explaining that the app won't be able to do its magic, and perhaps give the user another chance to authorize. For this demo, we're going to keep it simple and just ignore that scenario. So now we have everything we need to get access to Location Services while our app is running. Go ahead and run the app and you'll see that you get a popup with the message we put in our info.plist requesting authorization. Note: this is as far as you'll be able to get with the Simulator. From here on, you'll need to run the app on a real device (see the list of BLE iOS devices near the top of this tutorial). Ok, now that we have our locationManager set up, we have our View Controller delivering delegate methods, and our app has authorization to access Location Services, we're ready to start looking for beacons! Our locationManager looks for beacons via regions. 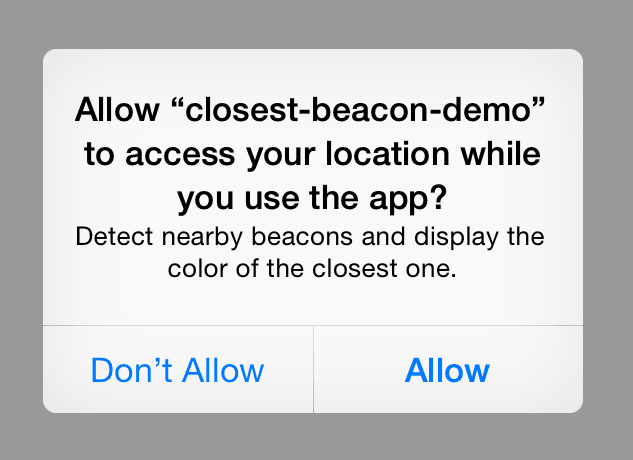 A region (CLBeaconRegion) defines which beacons our locationManager should care about. Each region defines a unique identifier (UUID) of the beacons which it should 'see'. There may be many beacons around, some of which aren't yours, and by defining a region with an identifier unique to your beacons, you can filter out the noise. For a refresher on how iBeacon uses UUID, Major, and Minor values, check out my earlier post on What is iBeacon. The identifier is just an arbitrary string that you can use to reference a region. When beacons come back from our delegate method, they are delivered with the identifier of the region they were found in. This would be helpful if you were to monitor multiple regions, but since we aren't, I just set the identifier to "Estimotes" (the brand of beacon I'm currently using). The println is just going to log out the array of beacons that are found. Now is a good time to run the app on a device and keep an eye on the debug area in Xcode. You should see an array of beacons printing out at regular intervals. Since the signal strength that gets reported from beacons tend to fluctuate quite a bit, you can count on this delegate method being called as often as a few times per second if there are beacons nearby. We're going to use these later, so let's put them in an array at the top of our View Controller. I'm using the minor values as keys (we'll reference these later), and I've come up with RGB values that are close to the color of my beacons. Be sure to replace the keys with the minor values of the beacons that you are using. There are three other values on each beacon: proximity, accuracy and rssi. proximity is an enum (CLProximity) with four possible values, 0-3, relating to how close the beacon is. This is a good, simple way to determine placement of beacons in a general sense, when you only need to know whether you are far away (3), near (2), or right next to (1) a beacon. Unknown values are reported as 0. You should expect to have multiple beacons return with the same proximity value. If you need to get more specific (like we do), proximity won't be precise enough. rssi is a measurement (in decibels) of the signal strength of the beacon. This will be a negative whole number, and the bigger the number (the closer to 0), the stronger the signal. Unknown values are reported as 0.
accuracy is a real-world number that you can actually understand. But it comes with a catch: don't trust it. accuracy is a measurement in meters of the distance from the beacon, with unknown values reported as negative numbers (always -1 in my experience). The reason you shouldn't trust the meter measurement is that it is very unlikely to ever be accurate. There are a lot of factors that affect a Bluetooth signal, and this value is only guessed at by measuring signal strength. It isn't reliable enough to be used as a ruler or measuring tape, but could be used in a more general sense that accounts for a hefty margin of error. You will notice though that in all these cases, unknown values are still reported. For our purposes, we want to ignore any beacons with unknown values, so let's filter them out from the array in the delegate method. Back to writing code! Here, we're creating a new array by filtering the beacons array that the didRangeBeacons method gave us. In the filter method, we're basically letting anything through as long as its proximity value doesn't match CLProximity.Unknown. Now for a note on the beacons array, and our new knownBeacons array. From my testing, the beacons arrive in the beacons array already sorted from closest to farthest, with unknowns coming in first, before the closest known beacon. That said, I can't find anywhere in the documentation mentions this, so I can't recommend relying on this to always happen in a production application. For the sake of simplicity here, we're going to just grab the first element in the beacons array as the closest beacon. And that's it! Run the app and start moving beacons closer and farther away from your device, and watch the background color change. You loaded the app onto a device, not the simulator. The simulator won't detect beacons. You're using a BLE device (see a list near the top of the post) and Bluetooth is turned on. You approved the request to use Location Services. If you accidentally hit Deny, you can either delete the app, or go into the Settings app and approve it manually. You updated your region to use the UUID of your beacons. In the colors array, you are using the minor values of your beacons for the keys.